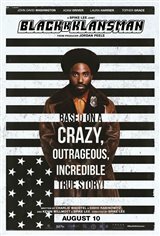 In the early 1970s, Ron Stallworth (John David Washington) becomes the Colorado Springs police department’s first black police officer. When he spots an ad asking people to call the Ku Klux Klan for more information, he dials and reaches David Duke, the Grand Wizard of the Ku Klux Klan. He tells Duke he hates Blacks, Jews, Mexicans, Italians, Irish and Chinese. And anyone else who doesn't have pure white Aryan blood running through their veins.